Remember the dot.com boom? Internet companies with no revenues and profits, but massively overvalued stock prices? The current mania round Bitcoin has a similar look and feel. Are people talking about Bitcoin? You bet. Were taxi drivers and hair dressers talking about dot.com stocks? You bet. And, that did not end well. Throughout history, markets of all kinds tend to "peak out" or post "blow-off" tops not long after the man on the street starts rushing to join the party. It is a cycle that repeats over and over again and Mom and Pop are always the one who get hurt. At tops the general public rushes in because they are attracted to rising prices. Just like Bitcoin right now. The general principles that underlie the markets don't change and continue to drive price cycles over and over again. We've already outlined 3 key reasons investors should be wary of Bitcoin 1) It has no intrinsic value. 2) It appears to be a bubble. 3) Bitcoin could simply disappear one day. 4. Is Bitcoin a currency? Let's talk about what defines a "currency." Since 1913 in the United States, our currency has been issued by the federal government. Backed by the full faith and credit of that government. It is physical. There is paper money and there are coins that you can touch. Bitcoin is not backed by any government. There is nothing tangible that you can ever see, touch or hold. In fact, bitcoin is the antithesis of gold. Let's look at some key characteristics of gold and why investors continue to turn to precious metals as a true viable method of wealth preservation and accumulation. Gold is a tangible asset. Gold is not issued by a government, which means it is nobody's liability (not associated with any government debt or deficit). It has true physical supply – you can only pull so much gold out of the earth. (Unlike a computer software program where they can change the "rules" and create more than 21 million bitcoins at any point in time). These are all part of the "altcoin" fad. Any of these cryptocurrencies could go bust at any time, leaving investors with zero. In fairness, these cryptocurrencies can explode in value as well. 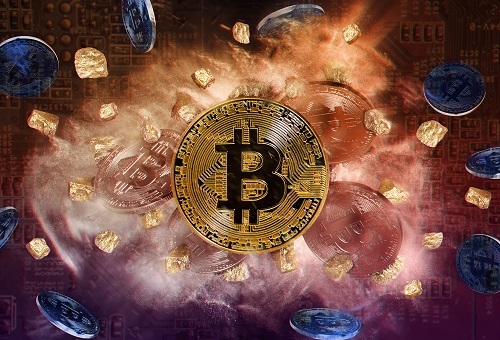 Sudden regulatory changes could emerge at any time in response to the concerns that this cryptocurrency is being used in black market transactions, money laundering and other illegal activities. Governments could ban the use of bitcoin at any time. The SEC has already warned that Bitcoin is subject to regulatory risks and federal securities laws. It would not be surprising for a regulatory body to issue regulations that could completely disrupt the availability and accessibility and liquidity of bitcoin. A Federal Reserve regulator said last week that bitcoin could pose a threat to financial stability. Regulators are just getting started. Once regulations come down, investors could be left holding a worthless piece of cyberspace. There are no bank robbers with guns. But, they steal money just the same. More than 980,000 bitcoins have been stolen from exchanges, either by hackers or insiders, according to news reports. That totals more than $10 billion at current exchange rates. Few of the stolen bitcoin have ever been found. Anyone who thinks they can avoid taxes using Bitcoin is wrong. A federal court has demanded that Coinbase, the largest cryptocurrency exchange to hand over its customer list to the IRS. More than 14,000 customers are suspected of tax evasion. Because Bitcoin is viewed like any other asset by the IRS, every transaction, no matter what size must be reported. Coinbase is fighting this, but they are expected to lose. The IRS is a powerful entity and will demand what its due in back taxes, penalties and fees once they obtain the customer list. Institutional investors are not investing in bitcoin. There may be some speculative trading in bitcoin. But, smart money investors are not buying bitcoin to buy and hold. It is a speculative market. The Wild West. The intense volatility of Bitcoin prevents it from being used in commerce in any meaningful way. The wild swings in price, both higher and lower, create uncertainty when it comes to buying and selling in bitcoin. It fluctuates – often dramatically – on a daily basis. In fact, in early 2017, McKinsey consulting firm said that it appears unlikely that the Federal Reserve for the U.S. Treasury will start accepting bitcoin as a form of payment anytime soon due to regulatory risks. It is, however, being used by criminals due to its decentralized structure and ability to move money from local currencies into bitcoin, and then out of the country and finally into a different currency. Bitcoin is no safe haven asset. It is a wildly risky and speculative investment. That compares to gold, which has proven itself over the millennia. It is real currency and a real store of value. Governments around the globe continue to buy and hold gold because of its true intrinsic value. Gold is rare. At the end of 2012, there were only 174,100 metric tons of stocks in existence above ground. If every single ounce of this gold were placed next to each other, the resulting cube of pure gold would only measure 20 yards in any direction, according to the World Gold Council." Investors who want to preserve and grow their wealth should consider a currency that has been around for over 2,000 years – has been tried and tested – a proven portfolio diversifier. From 1968 to 2016, optimal portfolio had 27-30% of its assets in gold and the rest in stocks and bonds, according to Jeffrey Christian, managing director at CPM Group. Can you make money in bitcoin? Some will, most won’t. Thank you for a fair and unbiased report. I appreciate the in depth review of bitcoin and truly appreciate articles like this that don’t insult my intelligence! As a bitcoin day trader I enjoy playing the market. I have an exposure to extreme volitility, and do not need to meet the $25,000 minimum requirements to do the same with day trading. Governments can try to regulate bitcoin, or even try to ban the trading websites. Like offshore gambling sites a vpn used with toar will circumvent government restrictions. Bitcoin is further akin to forex trading, although Coinbase places resrcitions on that function for possible regulatory reason. I’ve made back my losses from stock trading, precious metal investing, and options trading in 1 month day trading on the volitilty of bitcoin. I respect your report but I think it fails to address a majorities tolerance to extreme risk.